** OWNERS HIGHLY MOTIVATED. HUGE PRICE REDUCTION!!!!!! ** Want room and space? 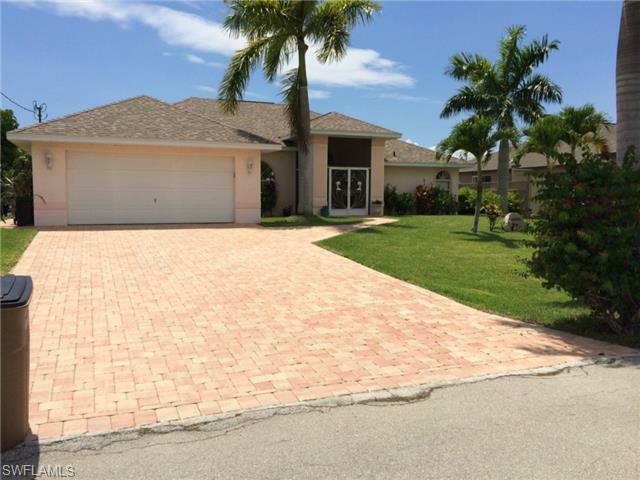 Check out this HUGE Beautiful Gulf Access home in the derisible SW Cape Coral Area!! Vaulted ceilings, rounded corners, wonderful paint schemes. When you walk out to the pool area and see the pool and dock, you'd think you were at a resort! Tiki hut with a giant composite dock and walk around for the boat lift. ( 12, 000 lbs.) Brick pavers for the driveway, walkways and pool area! A real nice A/C half bath at the pool area too! New roof in July 2011, New A/C in late 2009. Stainless steel appliances, indoor laundry area. Lots of closets and storage areas. Double door entry with a pretty foyer area. Large master bedroom with sliders to the pool area. Great western exposure to enjoy the afternoon sun and beautiful sunsets! Landscaping is lush with giant Royal Palms out front, Fruit trees, and an avocado tree. Professionally landscaped yard! Easy to get lost in this castle. This could be an ideal seasonal home for our European friends! Or someone with a large family! Schedule your appointment today!